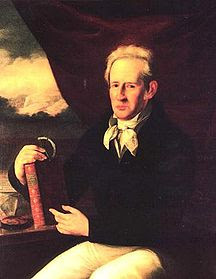 Born on November 10th in 1764 Andres Manuel Del Rio was the Spanish-Mexican mineralogist who discovered the element vanadium. After his studies in Spain, Germany, and France (where he studied under Antoine Lavoisier) Del Rio was appointed to the College of Mines in New Spain (Mexico) as the chair of chemistry and mineralogy. It was there he taught the first course of mineralogy offered in New Spain. In 1801, while examining samples from a mine in Zimpan, he arrived at the conclusion that he had found a new metallic element. He prepared various compounds of the new element which he named pancromium. Later, upon observing that when the compounds were heated, he decided on the name eritronium (Eritros is red in Greek). A year later he sent the samples to Alexander von Humbolt, who sent them to Hippolyte Victor Collet-Descotils who analyzed the samples and found only chromium, causing Del Rio to claim that his discovery had been in error. Later, in 1830, Swedish chemist Nils Gabriel Sefstrom rediscovered the element, which he named Vanadium after the Scandinavian goddess of love and beauty Vanadis. In the same year German chemist Friedrich Wholer analyzed Del Rio's samples and found that eritronium and vanadium were the same. Vanadium is an example of a transition metal. Transition metals are the elements found in the middle part of the periodic table (see a periodic table here where the transition metals are in green). These elements are very hard in their elemental from with high melting and boiling points. In this part of the periodic table the electrons in the loosely held d-orbitals are being filled in which make transition metals malleable and able to conduct electricity. For his discovery of the element Vanadium, Andres M. Del Rio is the Dead Scientist of the week for the week of November 8-14, 2009.